The Kodak Brownie Six-Twenty, one of the first American cameras with an internally synchronized flash, introduced in 1940. 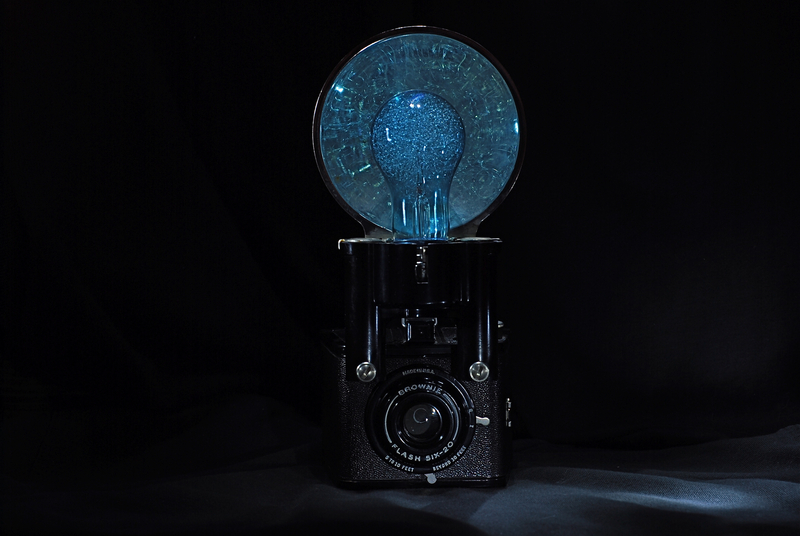 Manual light painting was applied during a 30-second exposure in a dark room to illuminate the reflector pan and the intricate bulb filaments without the use of flash. F/8, ISO 100, 50mm. PHOTOGRAPHY, AS AN ART, is part craft and part instinct. The craft, those purely technical rudiments for capturing an image within a camera, can be taught, most of them in a fairly short span of time. That’s the how of photography. The trickier part, by far, is the why of it, that intricate web of motives, guesses and dreams that can prove the work of a lifetime. Amazing advances in technology have greatly enriched the experience of creating images, since cameras are so reliable and easy to operate. That’s a remarkable luxury, since the photographer can now concentrate less on whether a picture will be generated and more on what kind of picture it should be. The design of many devices seems to center on taking troublesome decisions out of the hands of photographers, in the interest of producing more images with fewer faults. Instead of making the individual a better photographer, the emphasis is placed on making the camera good enough to save us from ourselves, to make the process foolproof. We always go home with a picture. Ironically, however, it is only in prying our fingers off the auto settings and factory defaults that we steer the process back toward direct touch, experience and vision. Taking a term from prime or so-called “normal” lenses, which visualize most like the human eye, I call this “normalizing”, a process by which our eyes reboot their settings, re-connecting us to the shooters we once were. Putting the tools of this magnificent age at the service of our instincts (rather than the opposite), we make the journey back from merely taking pictures to making images. To that end, THE NORMAL EYE is not merely a clinical workshop, as there are legions of pro’s covering the merely technical aspects of the medium, many of them far better at it than I. It strives, instead, to be a passionate discussion amongst “perpetual amateurs” taking their art back into their own hands, opting for adventure, randomness, even failure in search of the miraculous. This platform is a celebration of photography as a deliberate and ongoing act of art, perhaps the most democratic arena for artistry the world has ever known. It is a chronicle of our lifelong efforts to learn, re-learn, and even re-re-learn just how, and what, to see. Check in often to our BLOG page above for the latest posts, check out our specially themed tabs, and share your own thoughts and creative experiences. Welcome to this exchange. You are its most vital part. Hello, I’ve nominated your blog to Versatile Blogger Award. Richardo: Thanks so much for your kind words and actions. I will look over the detailed instructions you sent on how to pass on recognition to others in the blogosphere and shine a light on their work as well. Keep reading and feel free to offer your feedback, and keep up the excellent content on your own blog, which I greatly enjoy. This is such a thoughtful, well written blog, I am telling all of my photo friends about it. I enjoy your articles on the why of shooting, as one can get technical-overload information just about anywhere. Anyone with a passion for photographic arts should become a subscriber! Many thanks. Having spent most of my career as a writer in radio and television, I wanted to incorporate my thoughts into the process instead of just posting images. I truly appreciate the feedback. i don’t follow blogs – yeah, i have issues like many others – but your vision and words hooked into my subconscious and jerked me into the here and now, and the joyous response i am now experiencing. thank you. i await new adventures. I truly appreciate your giving me a look. All I am really trying to do is start an ongoing conversation with others like myself who are trying to move the football down the field, photo-wise. We all win by feeding energy to each other. Come back anytime, and thanks again for the comment. Just saw your blog . At this moment , I am rushed for time but I plan to return and check it out later. It looks so interesting. I really love smart and talented bloggers. By all means, come back anytime. We post about every other day and the interaction with other shooters is what the project is all about. Thanks for the look! Very cool blog. I dig what you are doing here. Keep it up! Thanks so much for the look! Feedback is everything here, so feel free to weigh in or share on any topic. For a new hobby I enjoy the thrill of searching for and discovering a blog that will draw me in with opportunity for being taught, inspired and enchanted. As an amateur photographer I find the same thrill whether five minutes or 5 hours out with the camera. Your blog is surely among the best designed, written and illustrated in all of WordPress. I will look forward to coming back again and again while sharing you with my best friends. Glad I met you, Sir! Thank you so very much for your warm comments! THE NORMAL EYE is all about sparking discussion, and I am always grateful when I hear from someone as obviously excited as you are to be behind the camera. That passion is contagious and will certainly inform your work as you go forward. I too have never lost the “tingle” that accompanies every picture-making outing, great or small, over a lifetime. Please feel welcome to share you own perspectives with us as you grow in this marvelous pastime! Michael, I’ve been meaning to contact you since I saw your photos and the link to your Website/blog on Facebook. It’s good to know you appear to be doing OK after all these years…and, by the way, Happy Birthday. Looking quite good for 63 and I think I still look good for 66 soon to be 67. Like you I have all my hair and none, I repeat NONE, of it is gray. I’d love to have the opportunity to talk with you and share what is happening in our lives. Without going into too great of detail here, I am an independent marketing consultant and writer of Web content and I have been writing for one photography Website for more than 4 years and just started writing for another during December. Send me an email, so we can exchange phone numbers and talk. Before I forget, I like your photography very much and your comments about your vision for your images and what you’ve learned taking them. Wow, what a great surprise to hear from you! Expect to hear from me soon. I’ve had a great adventure with this project, and would love to view your own work in the same area. Nice to see that you’re still connected to the photog world, and many congrats on your business. Look forward to linking up!